In most Boston Whaler boats of less than 18 feet in length there are no built-in fuel tanks in the interior of the hull. For many of the smaller boats, the usual 6-gallon portable tank provided with most outboard motors has adequately served. For the 17-Montauk model in particular, because of its outstanding abilities for its size, a greater fuel capacity is often required to satisfy the demands of its use. This article discusses in detail the installation of a Pate Plastics tank on a Boston Whaler 17-Montauk. In addition information is provided about other tanks, their dimensions, and their vendors. After problems with the two red 12-gallon OMC tanks in my 1987 17-Montauk, I finally decided to upgrade to a single large tank. I had seen Pate tanks before and was already predisposed to their matching "Desert Tan" color and good looks. I did a lot of research, and finally decided on a Pate C27 fiberglass tank. Pate Plastics offers four tanks for the Montauk. Their model number is designated by the capacity in gallons. Capacity in gallons; dimensions in inches. Prices as of 6/2002. It will cost you $443.50 including shipping for the C27 and the mounting kit. The tank is $370; the kit is $48.50 and the shipping is $25.00. The tank is available in "Desert Tan" to match the Montauk's hull color, but you must specify this color when ordering. There are a few things to know about the Pate tanks. First, and foremost, it is a one piece tank that may actually fit inside the factory deck pads, with a slight modification. The Pate Tank has a thin, raised 1/2-inch fiberglass molded edge around its entire base. The factory deck pads are designed for two separate tanks, and if the one piece tank is mounted inside the factory deck pads, the inner lip of the pad intersects the outer edge of the tank. The solution I have observed is to trim 1/2-inch section of the inside edge of the lips of the deck pads. The tank fits in the factory deck pads, with the inboard lip of the pads removed on either side of the thru hull fitting. The tank completely covers the old bilge access hole, and a new one has been drilled and capped. There is just enough clearance to access the tank filler. If this were a C27, I doubt you could fill it without hinging the seat. Again, the bilge access hole is covered and a new one has been installed. The factory deck pads do not appear to have been moved, and eyelets have been mounted directly to the deck for straps. This tank is even easier to fill than the one shown above because it is mounted farther aft. I have observed that the C27 cannot be filled, due to its height, when mounted in the factory deck pads. The clearance between the bottom of the seat and the top of the tank is too small. There are a few options I know about. One is to hinge the seat, as discussed below. Another is to move the factory deck pads forward, exposing a section of the original bilge access hole. The other is to remove the factory deck pads and move the C27 slightly aft. There are considerations with each. The outer edge of the tank made complete contact with the floor of the boat. With the pad installation, there is a 2-inch gap right down the center of the tank. While this would be great for water drainage, I was worried the tank might fatigue or split over time. I was concerned about the integrity of a hinged seat. The tank is easier to fill without a hinged seat. more exposure to sun and elements. In retrospect, after hearing from several forum members, I might now opt for an installation in the factory deck pads with a hinged seat. First, the installation is easier; you don't have to remove the factory deck pads. Second, there is less weight aft, a consideration when repowering with today's heavier 4 stroke engines. Third, there is more aft deck space. I decided not to move the factory deck pads forward because I liked having ample foot room between the console and the front of the tank. In order to expose a portion of the existing bilge access to accommodate a fuel line, the C27 would be so far forward that it interfered with my piloting space. Of course I could move the console forward, but this requires moving the cooler and chocks too. At least one forum member (Rex) has done this; he removed the entire interior, refinished the gel coat, and then remounted everything to his liking. This allowed him to move all the components forward, and expose the original bilge access for the fuel line. Pictures are available on Page 41 of Cetacea. What a boat! My project started with the removal of the factory deck pads. The factory deckpads are pop-riveted on. To remove them, I used a small drill bit (maybe 1/8-inch) and drilled out the center of the pop rivet. I then pulled the rivet straight out with pliers. This sounds much easier than it is, so I had to be patient. Believe me, do not over drill these suckers because you can split the outer sheath, and end up with a mess! With a new C27 tank in the old factory deck pads, the bilge access will still be covered. Once all the rivets were out, I cleaned the rivet holes with a drill bit and the area around the holes with acetone. I then filled the holes. Experts suggest using wood dowels, epoxy, then gel coat; I just used 5200 (quick cure) in a syringe, and then cleaned up the surface with solvent. When I positioned the tank, only the rear holes were covered. The front holes were just barely exposed. I decided to use one piece teak strips instead of the mounting blocks, so the old (front) holes were not visible. If you're not sure, position the tank first, then if there are exposed holes, consider filling with dowels, epoxy, and gel coat. Now the tank. I had to position it so that the tank's filler hole is accessible from the rear of the Reversible Pilot Seat (RPS); the seat of the RPS gets in the way. I simply removed the old center strap eyelets and snuggled the rear inside edge of the tank rim against the old bilge tube access plastic flange. I actually cut the aft edge of the plastic flange 1/4-inch (to flatten it out) with a razor and a metal square. I squared the tank and marked its position with pencil. My old bilge tube access was now covered by the tank. I removed the tank, and decided where I wanted the fuel line hole to enter the bilge tube. I decided that 1.5-inch from the edge of the tank was sufficient. I left space between the tank and the planned access hole for the mounting hardware. Now the tricky part. I went to West Marine and bought a threaded "mushroom" thru hull fitting that would accommodate my 5/8-inch fuel line. The mushroom's stem needed to be a good 2-inches long. I then bought a hole saw that makes a circular hole the exact size, maybe a little smaller, as my hull fitting. The hole saw comes with a 1/4-inch pilot bit. Next I tried to find the exact center of the bilge tube where I wanted my new hole. Guess what? The center of the plastic access flange may not accurately represent the top dead center of the bilge tube. I used the flange to measure where to cut the hole, and it was slightly off. I later realized that the flange was off center. Maybe I should have removed the flange, found the center, then found the center at the aft access, and chalked a straight line. I then took a break, sipped a beer, and returned to position and measure everything again. I then took a deep breath, and drilled the fuel line hole. I cut through the gel coat, the fiberglass, the wood backing, the foam core, and the top of the aluminum bilge tube. I was careful not to drill too far, and into the controls cables and electrical wires already inside the bilge tube. In fact, after I started the big hole, I shortened the pilot bit and continued. [Excellent idea!--jimh.] Once I had the hole drilled, the hard part was over. I took a round file and feathered the gel coat around the fuel line hole. This is so the gel coat would not crack. Whenever I drill a hole in gel coat, I always feather the gel coat. When a screw is inserted into gel coat, it cracks. There is no flexibility in gel coat at all, whatsoever. It is like trying to screw into glass. For example, when I drilled the holes for the mounting blocks (strip), I drilled the holes with a drill bit slightly smaller than the diameter of the threads of the screws. Once I had all the screw holes, I took a large drill bit (there is an actual bit called a "reamer" that is meant for this, but you can use a larger bit to accomplish the same thing) I drilled the top of the hole until the spoils turned from tan to green, This only took 4-5 rotations of the large bit. The gel coat is very, very thin. The object is to slightly broaden the gel coat but not the fiberglass underneath, to which the gel coat is adhered. The screws threads will now bite into the fiberglass and wood underneath the gel coat, but not the gel coat itself. I added a touch of 5200 in the new hole to seal. I then measured the depth of the fuel line hole, and cut the length of the thru hull fitting to just beyond the top of the bilge tube. With the thru hull cut to size, I was ready to seal the fitting. The fitting must be sealed. Experts say epoxy, I used 5200 because it is less messy. I gooped it in the hole and on the thru hull threads. I then screwed the threaded, mushroom thru hull fitting into the hole. My thru hull fitting was really hard to thread into the hole; I used a large, flat file to turn the thru hull fitting. You'll understand when you see thru hull fitting. Now the easy part. I positioned the tank, and prepared to install the mounting blocks, planning to drill the holes as described above. I decided against a rubber pad or dry dock type of pad. This was due largely to vertical space considerations, and because I wanted the mounting blocks to snug right up to the lowest point of the tank. I felt that if I elevated the base of the tank with a pad, the blocks might not be tall enough to prevent it from sliding around. The added benefits of a tank pad are water drainage and reduced abrasion on the non-skid. I might consider it if I had installed the C24. The mounting blocks are just that: 2-inches long, 1/2-inch square. The blocks are pre-drilled, and the kit includes the screws, washers, bungee cords, and eyelets. I opted for one long strip of teak instead of the blocks. The hardware was useful, though. The standard mount is two blocks on the front and back corners, with eyelets for the bungee, and one block on the port and starboard side to prevent lateral movement. I did the same sort of thing, but used teak strips instead of the blocks. After all was said and done, I put the tank in, mounted the hardware to the deck floor, and strung the bungees. It looks great! I had to put an 1/4-inch elbow fitting in the gas pick-up tube because the quick connect I was using was too long and wouldn't fit under the seat. Then I ran a new gas line through my new hole, and out the back, to the engine. I later mounted a gas filter and relocated the primer bulb, but that is another story! The end result of the process described above! The original deck pads have been completely removed to enable better clearance in the tank height and to permit flexibility in fore-and-aft location of the tank. In addition to off-white hues, the Pate Fuel Tank is also available in more traditional red. The fuel level in the tank can be easily seen in this somewhat translucent finish. The following is some research based on forum members' contributions (cited without attribution). 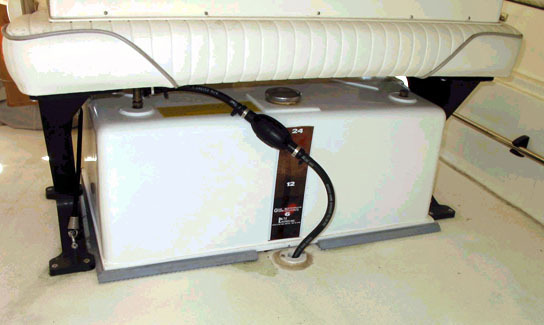 A comprehensive thread on Montauk fuel tanks is in the Repair/Mods Forum. It contains a great deal of information on this subject and should be consulted by anyone interested in on-deck tanks. 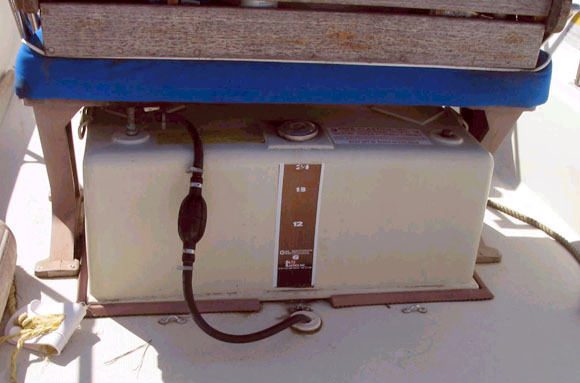 Coast Guard regulations define "portable" fuel tanks as less than 7 gallons capacity. [This is in dispute. The actual regulations do not appear to cite any particular capacity, but rely on the ability of the persons onboard to be able to move the tank as a verification that the tank is not a "permanent installation." The Coast Guard Auxiliary vessel safety inspection form appears to define a portable tank as less than 7-gallons--jimh] Any "permanent installation" fuel tank must have a vent which is plumbed overboard. 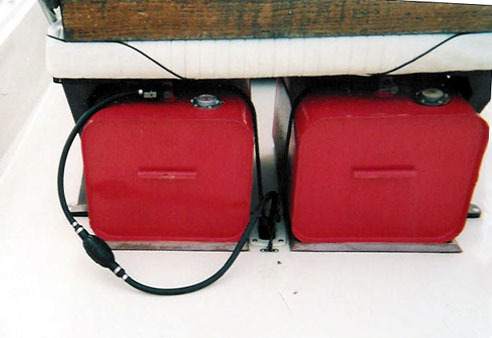 In theory, any tank on board your boat without an overboard vent which you could not demonstrate could be lifted and removed would fail a Courtesy Safety Inspection (done by the Coast Guard Auxiliary). 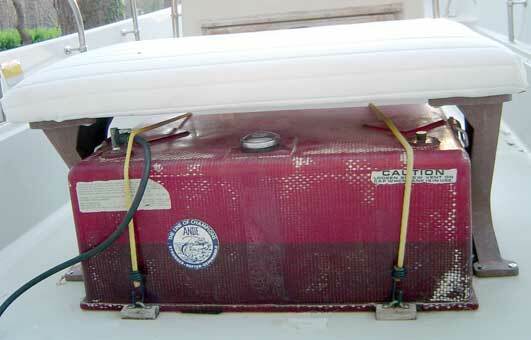 Most boat and engine manufacturers don't sell their boats with the larger portable tanks, thus avoiding the issue. The tank manufacturers (Tempo, Moeller, and others), are selling a tank-only and are not responsible for how you use it, and they sidestep the issue in that fashion. The most common tank in a Montauk was a 12-gallon tank with mechanical gauge with rough dimensions of 12 x 14 x 18.5 inches. Stainless steel tanks are the most likely to develop leaks. The risk of static electricity explosion is greater in plastic tanks as they are not easily grounded and rarely grounded properly. With twins you have the ability to adjust the balance of a Montauk with the fuel load, (we all know how important it is the adjust weight to get a Montauk to run on an even keel). You can also run the fuel hose for your main motor off one tank and the fuel line for the kicker off the other. When fuel gets low, but not empty, on the main engine's tank, you just swap hoses. It is also a lot easier to slide a full 12-gallon tank back under the RPS than it is with the big tanks which always seem to have some gas cap conflict or chocking issue. UPDATE 2011—Mirax Fuel Products is the new name for the manufacturer of Mirax aluminum fuel tanks. [See updated information above on Mirax. This older information is no longer accurate--jimh] Mirax are still making aluminum tanks for Boston Whalers. The company is Mirax Chemical Products in St. Louis, MO, (Phone number is (314) 752-1500) and they have a sister company KSH Marine. For a Montauk's under-the-RPS a 12 gallon aluminum tank complete with cap and dip tube is available for roughly $175. You'll want two. If you want to run a single tank, you can save a few bucks: a 24-gallon tank is about $265. They offer a lifetime warranty to the original purchaser. I believe they would work with you if you want to have a tank of a different size to put in a different location. Todd Enterprises [at one time made] a number of tanks, and one of them was claimed to be "Factory designed for Boston Whaler applications." It is an 11-gallon red cross-linked molded polyethylene tank. The Tempo 28-gallon tank claims to fit perfectly under the seat. Some have had to replace the filler cap with a low profile cap to make it fit. Another popular solution is two 13-gallon Tempo's. Unfortunately, all of the Tempo tanks are red plastic. The Tempo #C2814 28 gallon tank will fit under the seat perfectly but you do need to slide it aft for filling. The mechanical gauge on the 28 gallon is inaccurate. Tank is $105 bought right. Hold down kit is about $15. Anecdotal reports cite Tempo tanks leaking through the "fuel gauge" fittings from day one. The 12-gallon Tempo tanks would not fit under the seat because of the high vent/fuel cap. Replace with a low profile vented cap; slide them out for fuel. The Tempo 19-gallon tank the part number is F1218. 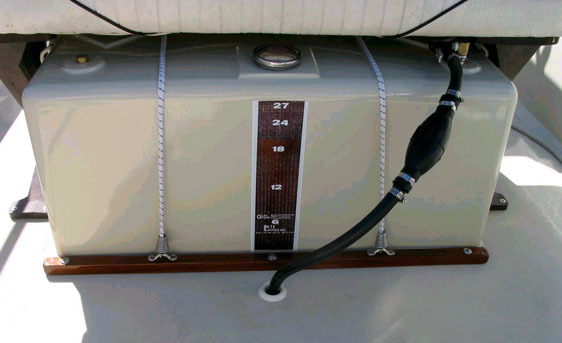 Dimensions (in inches) are 15 W X 28 Lx 12 3/8 H.
Montauk Fuel Tanks: The "Mother of All Montauk Fuel Tanks" Threads. Copyright © 2002 by Robert Schmidt and James W. Hebert. Unauthorized reproduction prohibited! Author: Robert Schmidt with an introduction byJames W. Hebert. Conversion to HTML by James W. Hebert. This article first appeared June 9, 2002. Edited some material related to USCG Regulations on tanks, August 23, 2002. Appended links to other threads November, 2003.